The area around Dawson City lured thousands brave young men and women to join the world's last great gold rush in 1897. It is today bursting with attractions and sights centred on this romantic piece of Canadian history. 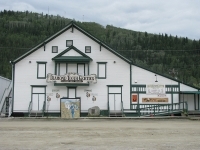 Dawson City itself is a colourful town with boardwalks and plenty of restored buildings, including Diamond Tooth Gertie's Dancehall and Casino. Then there is Carmacks, originally a riverboat fuelling station that is now a community preserving the First Nations culture, with an interpretive centre sketching aboriginal history over 10,000 years. Fort Selkirk is the oldest settlement in the area and now survives as a living museum. The other venue to visit on the Klondike Trail is Pelly Crossing, where the life and times of the Northern Tutchone people is preserved at Big Jonathan House.